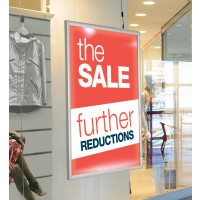 Scribo Displays provides LED snapframes that enable you to display information about products and services at your events. The LED snapframes can be mounted on walls or fixed to stands that enable floor to ceiling displays. These snapframes that open outward are available with anti-glare poster cover sheets that help to protect the quality of your poster displays from the vagaries of the weather. Our cost-effective LED snapframes can be used for promoting products and services at indoor and outdoor events. A glimpse of our collection of LED snapframes might help you to invigorate your displays and attract larger crowds at your upcoming events.